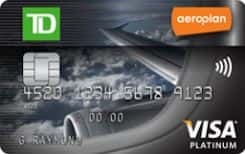 Earn miles twice4 when you pay with your TD Aeroplan Visa Platinum Card and present your Aeroplan Membership Card at over 150 Aeroplan partner brands and with 100 online retailers through Aeroplan’s eStore. Visit aeroplan.com for a list of participating Aeroplan partners. This CAD currency 73 is issued by TD and runs on the VISA Network. The purchase interest rate for this credit card is: 19.99 percent annually and the transfer balance interest rate is: 22.99% per year. Also the cash advance rate is: 22.99% per year. Travel cancelation is Not available for this credit card and also travel accidents are Included.